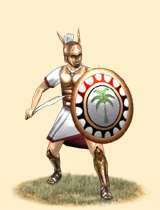 The Iberian Assault Infantry is an assault infantry unit of hand picked Iberians at the service of Carthage. They are well armoured and armed experienced veterans ideally suited to taking fortresses and smashing into enemy troops. During the Second Punic War, Hannibal found that the Italian troops under his command were less than able to be trusted with the capture of important strategic areas. Thus, he undertook to amend the training of some of his Iberian and Balearic troops in order to provide good assault infantry. They were equipped with the standard fare of assault troops, large round shields and javelins. They kept their falcatae, but gained new iron armor and helmets made in the Bruttian style. These troops can be called upon as an elite assault infantry that will be ideally suited to taking fortresses and smashing into enemy troops. Historically, the capture of many Italian cities was due to these hardy and elite troops. Iberian assault troops, together with the elite of Hannibal’s Gallic infantry, took Tarentum with very little bloodshed. They were used and trained primarily during the Second Punic War, but a wily Carthaginian general could use them to great effect earlier, provided he has the necessary know-how and facilities. Assault infantry were something lacked by the Carthaginian armies earlier, but were well within reach by the time of the Punic Wars.